The selling of whitening creams is a lucrative business in Africa worth millions of US dollars a year. In some countries that allow the use of these lethal substances, shelves in pharmacies are stacked high with lotions, creams and soaps all promising to make women whiter and supposedly more beautiful. But, in countries like Tanzania, where the use and importation of skin lightening creams is banned, the business is thriving as these dangerous creams are smuggled into the country while dealers on the other hand are discrete. So many women in Tanzania are regretting the days they laid hands on these creams as instead of attracting men, they are now scaring them away as they look like monsters with a lot of scratch marks and black dots on their skin after getting burnt by the creams. Some of them have been unlucky and had to pay the price the rest of their lives as they contracted skin cancers. The Tanzania Food and Drugs Authorities, has for a long time and in vain been fighting the importation of counterfeits and those unsuitable for human use as they are smartly smuggled into the country. Skin bleaching creams were first pushed onto the market in the United States, from Asia, for African-American women who were encouraged to keep their skins lightened in an effort to emulate the Caucasian woman, who was put on a pedestal as the ultimate measure of human beauty. Later, the market was expanded to Apartheid South Africa and then onwards to East Africa until it eventually ended up in West Africa where it has taken root, from Senegal to Cameroon. Asia is arguably the hub and origin of these creams which boasts of a long history stemming back to ancient China and Japan, where the saying “one white covers up three ugliness” was passed through the generations. In their early bid to lighten up, Chinese ground pearl from seashells into powder and swallowed it to whiten their skin. It is unfortunate, however, that over the years, women have been misusing these creams to enhance their beauty. 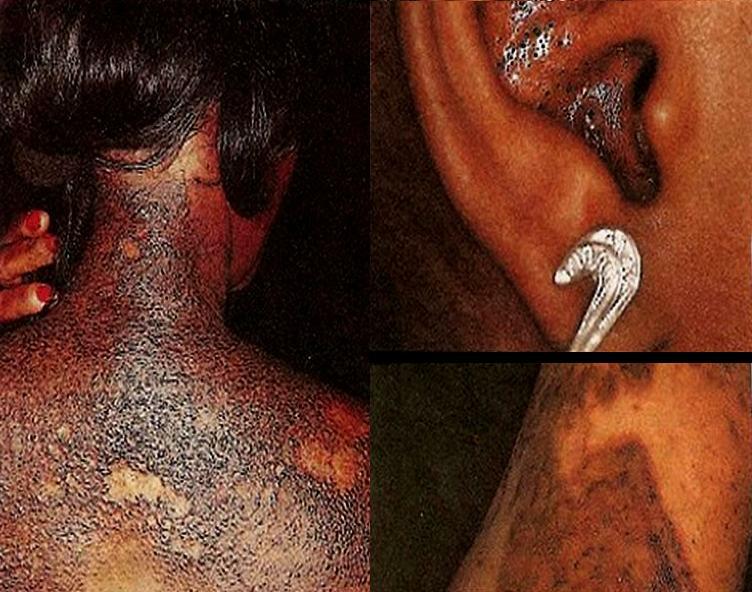 But, the sad thing about these skin bleaching creams is the highly potent and toxic chemicals they contain, which are eventually harmful to their users. Most of them contain corticosteroids and hydroquinones, which peel off the outer layers of the skin, exposing it to the harmful rays of the sun. Bleaching can cause skin cancer and the poorest people are the most at risk, because the cheaper the product, the more dangerous it is. Furthermore, there is suspicion of an increased risk of kidney failure as a result of the mercury contained in some of the products that people use for bleaching. In Tanzania, women have been urged against ignorant use of these chemicals to bleach their skins following a confirmed case of a woman who died after swallowing tablets to enhance her beauty. Dr Dominista Kombe, a consultant radiotherapist at Ocean Road Cancer Institute, told a two-day workshop recently that the woman (name withheld) who had taken tablets to bleach her skin, died after her flesh turned into liquid form like ice cream and started dropping off. This is just but a tip of an iceberg in this country where many women strive to be beautiful. But, it is surprising that despite reports and evidence of women suffering from using these creams, Tanzanian women seem to be undeterred as they continue to crave for white skin.